Summer is right around the corner, and that means friends and family gathering together for summer parties. And what are parties without delicious food? Your kitchen is one of the most important rooms in your home, especially when entertaining guests. 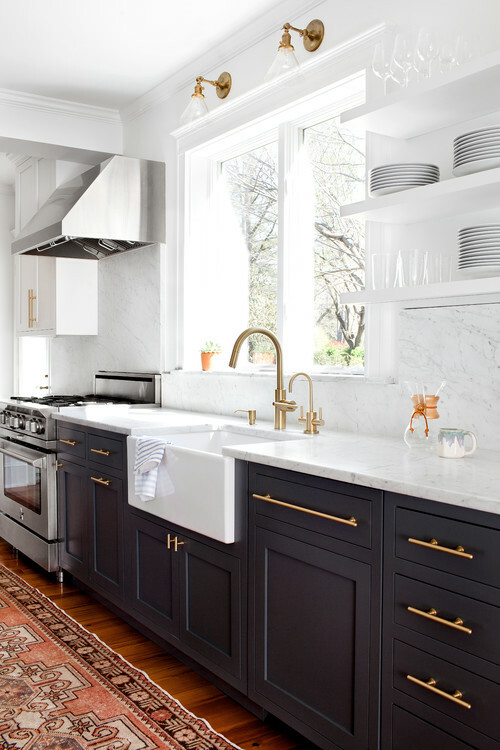 These 8 kitchens are some of my favorites, not only because they have interesting designs and are beautiful, but also because they are totally functional, with plenty of cabinet and counter space. Check them out below, and let us know which kitchen is your favorite! I really love this kitchen (even though you can only see one wall), because of the stark contrast of the light walls and backsplash with the dark cabinets and flooring. I like the old-fashioned, rustic feel of this kitchen. 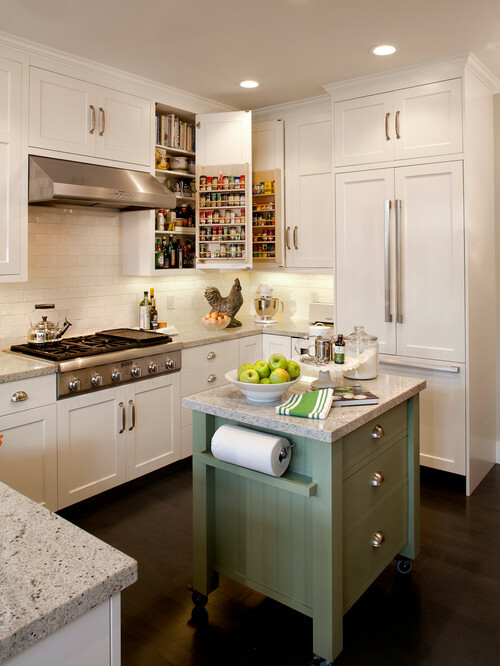 To me, the room feels almost serene, with the pale green cabinets and walls. It's a great use of color without being overwhelming. 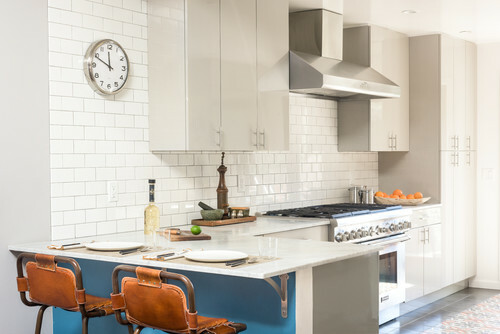 This kitchen proves that even smaller spaces can be beautiful and functional. The spice racks on the cabinet doors is a great space-saver, and the green island adds a pop of color and extra storage (and it can be moved for greater accessibility into the rest of the space). So cute! This kitchen really caught my attention because of the way the cabinet doors are painted. I have never seen cabinets painted like that, but I absolutely love the way it looks! 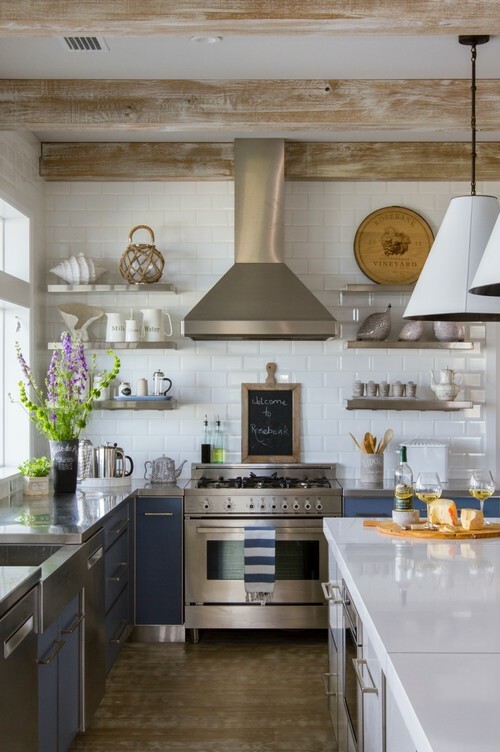 This kitchen is very sleek with the white subway tiles and off-white cabinets. 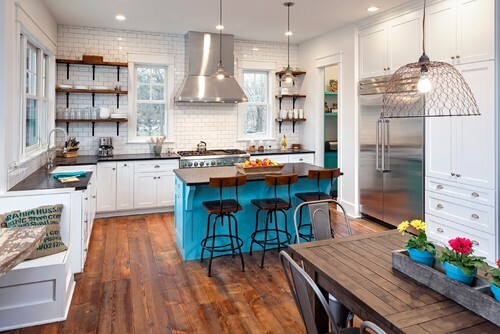 All the light colors in the room just make that hint of blue pop even more. 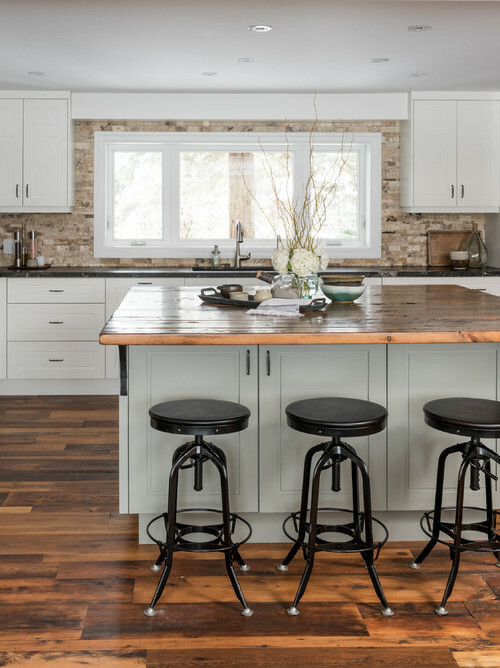 This kitchen is similar in color to the first kitchen, with the light walls and dark lower cabinets, but this kitchen is a little more industrial with the silver countertops, sink, and handles. I am crazy about this kitchen. It is so bright and the blue is such a fun accent color. You can even see it in the pantry just off the kitchen. And these floors are just gorgeous. Add in all the cabinet and counter space, and you pretty much have a perfect kitchen. This final kitchen looks like my kind of kitchen (complete with cat)! 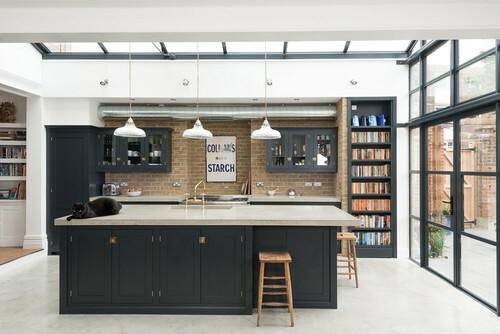 Exposed brick is one of my favorite features in a house, and here it complements the dark cabinets beautifully. I would live in this kitchen. Remember to like us on Facebook, and tell us which kitchen look is your favorite!